I bought these two photobooks in Kuala Lumpur. The bookshop Kinokuniya is based in the shopping mall under the Pertronas twin towers is an excellent bookshop with a respectable supply of quality photobooks. Actualy better than what I have seen in the Netherlands in any bookshop. The first book is The Streetphotographer’s Manual by David Gibson. It is what it says it is: a manual for the street photographer. Gibson has an interesting wide view on what street photography is (not just close-up-Bruce-Gilden-style portraits). He provides interesting guidance and views on how to shoot more creative and interesting street photo’s. The book also includes profiles of well-known but also unexpected photographers: Trent Parke, Erwitt, Elliott, David Salomons, but also our own Caspar Claasen, and Jack Simon. 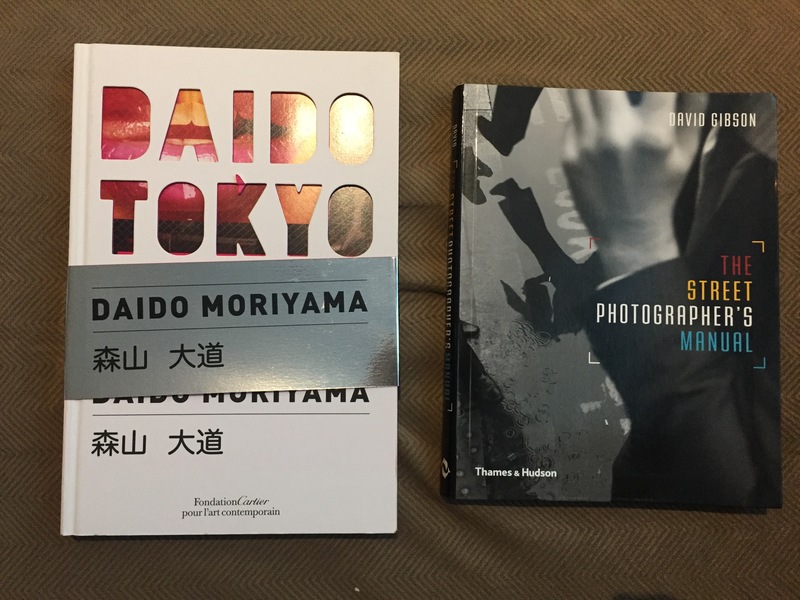 The second book is Tokyo by Daido Moriyama. This books consists of 2 quite different parts: a color part and a silvery-print black and white part. The black and white part, the second half of the book, is printed with a special technique in which the white of the photos is printed with a silver-like color. I very much like the color part of the book. I guess many people will detest Moriyama’s pictures of ordinary things. Also here he starts out with a picture of women’s shoes, or rather of the soles of women’s shoes. I find that very entertaining. It’s immediately clear what you can expect from the book. The balck and white part I find less appealing. Too much staring to find out what’s going on. But only the color part is already worth the money. This entry was posted in Uncategorized on 18/01/2018 by fromthepolder.